THE GEAR Jersey: O’Neal Hardwear Flow-True, Pants: O’Neal Hardwear Flow-True, Helmet: Scorpion VX-R70, Goggles: Viral Brand Rookie Series, Boots: Gaerne SG12. Q: IS THE 2019 TM MX250FI BETTER THAN THE 2018 TM 250FI? With only 1200 TMs produced at the Pesario, Italy, factory per year, TM’s aren’t for everybody. Mainly because everybody can’t get one. The majority of TM production goes into two-strokes, not four-strokes.A: We didn’t test the 2018 TM 250-FI. Why not? We had one logical reason—we tested the identical 2017 model just a few months earlier; however, there had been a six-year gap between the 2017 MX250-FI test and the previous 2011 model. Why the big gap? TM is an Italian boutique brand that has built its reputation on high-performance two-strokes. Over the years, if given the choice to hand a two-stroke or a four-stroke model over to the MXA wrecking crew, they always wanted us to test the smokers. Those were their bread-and-butter machines. Over the ensuing years, a lot has changed with TM’s four-strokes. Do we know exactly what has changed? No. TM’s Italian engineering department is very tightlipped about the technical details of its updates. So, for the most part, we had to do our own investigating. Q: WHAT’S DIFFERENT FROM THE 2017–’18 TM 250-FI TO THE 2019 MODEL? A: Since TM Italy doesn’t release info on the technical changes to its latest bikes, MXA had to do our own detective work. 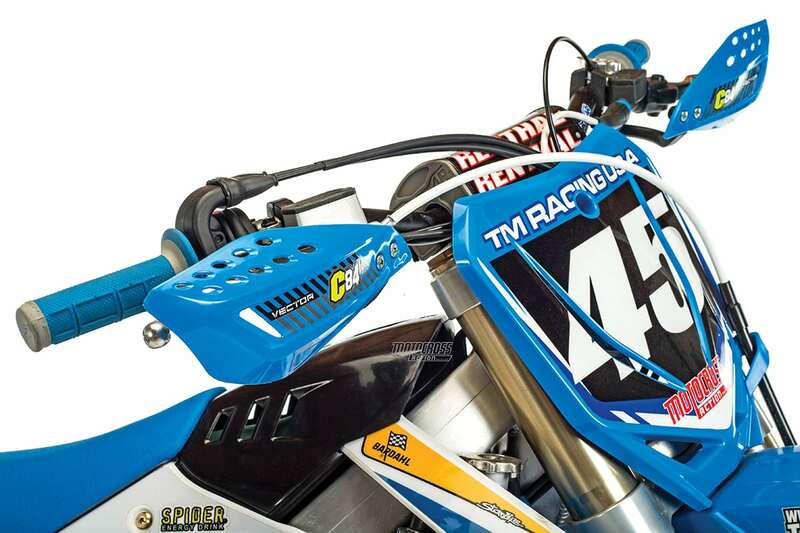 We know that TM Racing’sformer 250 Grand Prix racer Samuele Bernardini raced and developed the 2019 TM MX250-FI for three years. 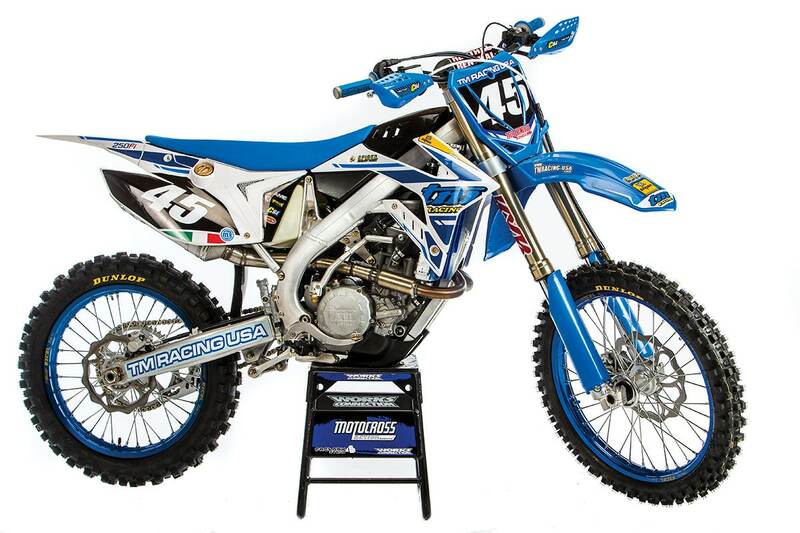 The engine in the 2019 MX250-FI production bike is a replica of what Bernardini raced. Obviously, TM wasn’t rushing the project into production, and insiders told us that the R&D time on the all-new twin-pipe MX250-FI was the longest in TM history. 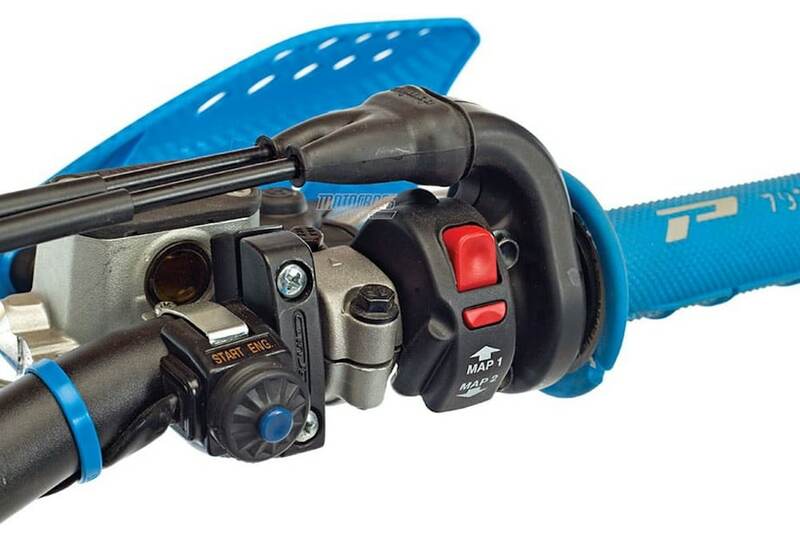 TM bristles with creative ideas, like their downdraft intake system, gear-driven cams, front mounted airbox, F1-style gas cap, inhouse engine, TM-designed rear shock and Italian-built aluminum frame. Q: WHAT’S DIFFERENT ON THE 2019 ENGINE? A: Visually, the biggest difference is that the whole engine appears to have sprung from TM Motorcycles’ foray into MotoGP3 road racing. The top end of the MX250-FI is the offspring of its MotoGP3 design, while the bottom end appears to be recycled from the 2018 motocross engine. When we pulled the valve cover off the 2019 TM MX250-FI engine, we could see that the cams were completely different. They were mounted much lower in the cylinder head, making for a lower center of gravity as well as a stronger cam tower and valve-stem setup. Most surprising, the cams were gear-driven. In function, there is a cam chain, but it is very short compared to the typical chain. 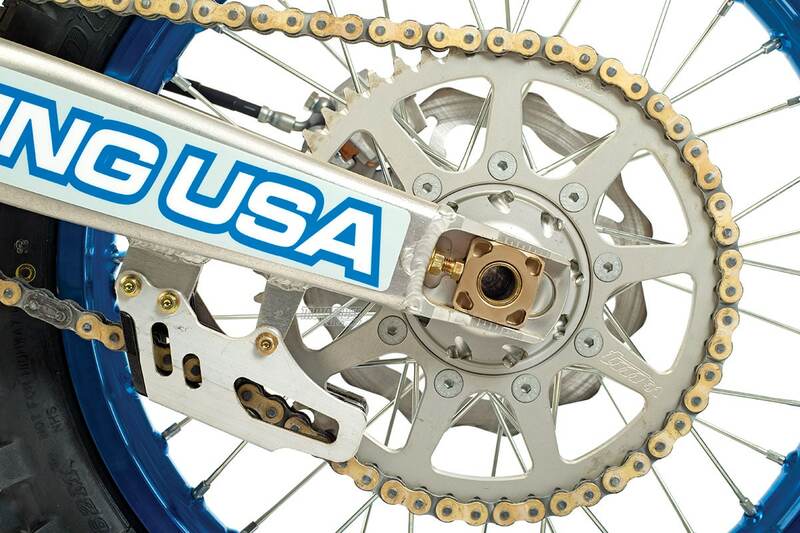 The cam chain runs on a single sprocket that drives the gears that turn the cams. This has two benefits. (1) It allows the valve clearance to be adjusted without having to take the cam chain off. (2) The cam chain can’t jump timing like it has been known to do on past TM models. The only downside is that it makes the MX250-FI engine a little louder with the addition of some gear whine, but this is hardly an issue with the cacophony of noise coming from the TM’s very obnoxious front-mounted airbox cover. You don’t need to be Sherlock Holmes’ younger brother to notice the dual exhaust ports, twice pipes and two mufflers. It is easy to assume that TM is copying the idea from the 2018 Honda CRF250 twin-pipe engine, but engine development doesn’t work with the snap of your fingers. TM has obviously been working on this design for several years, probably in conjunction with the MotoGP3 effort. What are Honda and TM trying to achieve with the added complexity and weight of twice pipes? Top-end power. 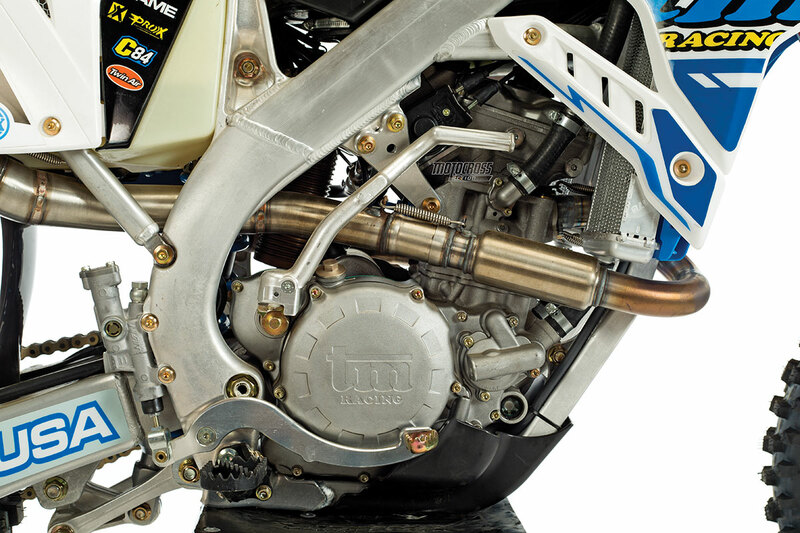 Just like with the Honda CRF250, TM’s engineers gave up bottom and midrange to get a 14,000-rpm upper rev range. Q: WHAT’S DIFFERENT ON THE 2019 MX250-FI SUSPENSION? A: The biggest difference is that the front and rear of the 2019 TM MX250-FI are vastly improved. The bike feels balanced, the stinkbug geometry is gone and the mix-and-match suspension components finally feel like they weren’t designed by a committee. You will be impressed to know that TMs come with Kayaba SSS forks; yes, the same forks that have made Yamaha the top-of-the-pops hit for the last 12 years. However, it should be noted that Yamaha and TM have never shared the same valving inside the forks; Yamaha had the good valving and TM had the bad valving. That seems to have been resolved for 2019. The Kayaba SSS forks have all-new settings, a friction-reducing coating and silver upper stanchions (instead of last year’s black tubes). The shock is not from Kayaba. It is made in-house at TM’s Pesaro factory. Visually, it is a thing of beauty, but in the past it has been hampered by a super-stiff spring and wonky valving. In previous tests, we typically changed out the shock spring immediately for something more in tune with the weight of the typical 250 rider. MX250-FI riders won’t have to do that for 2019. TM’s suspension department re-valved and re-sprung the shock to match the feel of the forks. 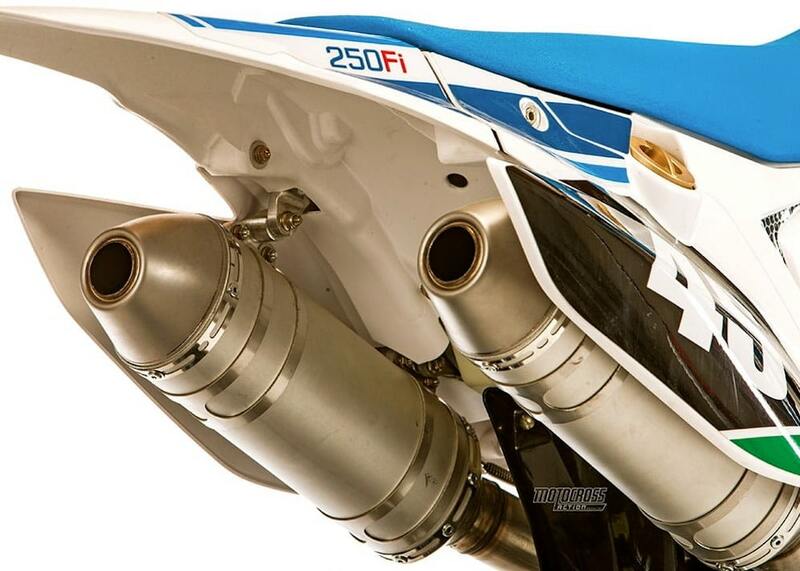 Borrowing technology from the MotoGP3 road race program, the 2019 MX250-FI has gear-driven cams and twin pipes. Q: WHAT HAPPENED AT TM TO BRING ABOUT SUCH A SEA CHANGE IN DESIGN? A: Over the years, we’ve never understood why an Italian-designed bike would be so very tall, stiff in the rear and have such harsh forks. Italians, by their genetics, are short in stature. We can understand why the taller Swedes, Germans or Austrians would favor tall machines, but not Italians. 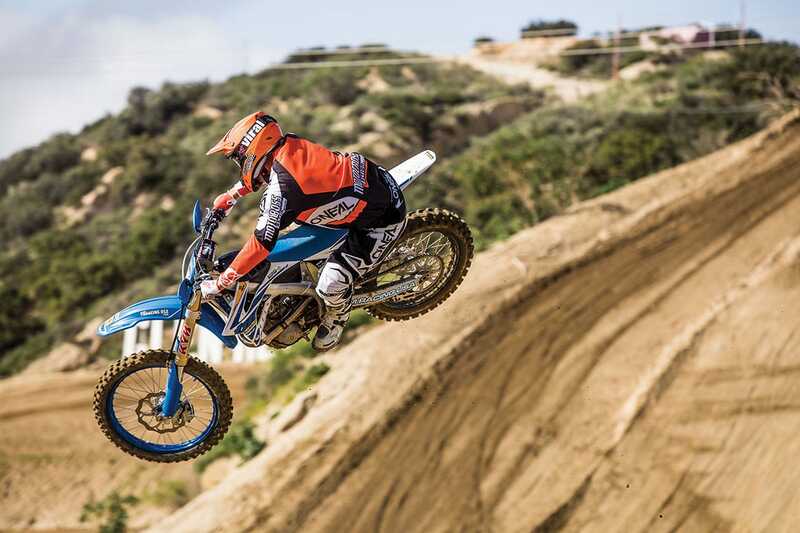 It’s no secret that we think all motocross bikes have become too tall and that they would all benefit from lowering the seat height at least an inch—and more so with TMs. TM’s modus operandi confuses us. Why are they so secretive? Why so far off on their suspension setup? Why so slow to change? Whatever the answers may be, TM has finally started to fix the issues that vexed the MXA wrecking crew for years. Do they say that they haven’t made any changes when it is obvious that they have, because they are too proud to admit that they were wrong in the past. Believe us, we can feel the difference between the TM setup now and then. The simple fact that our feet can touch the ground now is a dead giveaway. Would it kill them to tell us that they cut the subframe, shortened the shock, changed the fork spring rate or tightened up the frame geometry? We may never know what they are thinking, but we do know that the 2019 bike is much better. The 2019 TM MX250-FI comes with two maps, electric starting and, just in case, a kickstarter also. Q: WHAT DOES THE 2019 TM MX250-FI WEIGH? A: TM discovered the same thing that Honda did last year; you can’t add double the exhaust spigots, head pipe flanges, mid-pipes, mufflers and supporting hardware and get a gold star from Jenny Craig. The two heaviest 250cc four-strokes on the track today are the Honda CRF250 and 2019 TM MX250-FI. What do they have in common? Twice pipes and electric starting. In truth, we can’t blame the electric starting for the weight gain, because the lightest 250, the KTM 250SXF, comes with it and weighs 218 pounds. Conversely, the CRF250 hits the scales at 228 pounds, while the TM is a hefty 230 pounds. All is not lost, though. It can be rectified. How do we know? Because five years ago the KTM 250SXF weighed 231 pounds—and look where it is today. TM does have an excuse. We tested the electric-start version; and it also had a kickstarter. They don’t make the electric-start model without adding the kickstarter. Why? They say that people want a kickstarter, just in case the battery dies. That thinking will go away in time. How do we know? We were nervous when KTM took the kickstarters off of its e-start bikes, but we aren’t anymore. TM does make a kickstart-only model of the MX250-FI. It is cheaper and about 5 pounds lighter. Much like the twin-pipe 2018 Honda CRF250, the TM gives up low-to-mid for top-end. Peak power is at 12,500 rpm. Don’t assume that TM copied Honda’s twin-pipes, without assuming that Honda copied Husqvarna’s twin pipes and Husky copied CZ’s twin pipes. Q: HOW MUCH DOES THE TM 250FI COST? 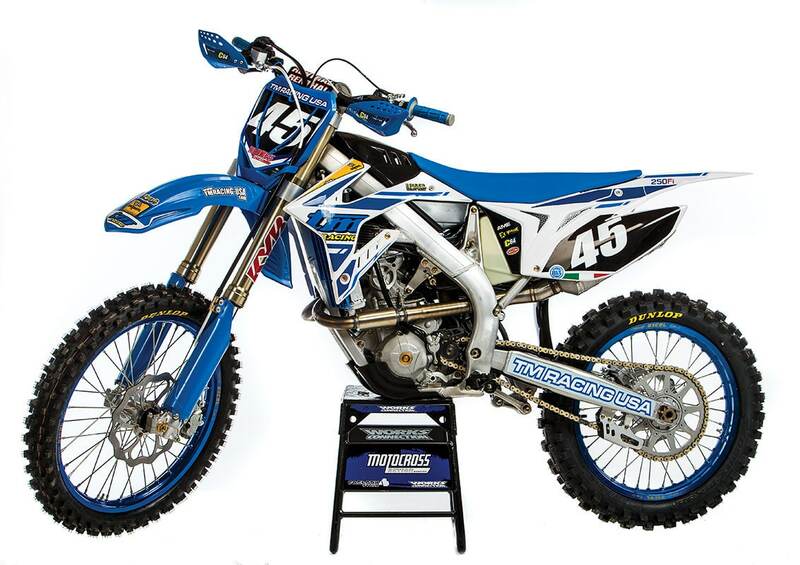 A: TMs are the most expensive motocross bikes sold in the USA. At $10,795, they cost over $2196 more than the next most expensive bike in the class, the $8599 Husqvarna FC250. The KTM 250SXF comes in $200 less at $8399; the CRF250 is $7999; while the KX250F and RM-Z250 are tied at $7749. The Yamaha YZ250F is the cheapest at $7699. Awesome front brake. 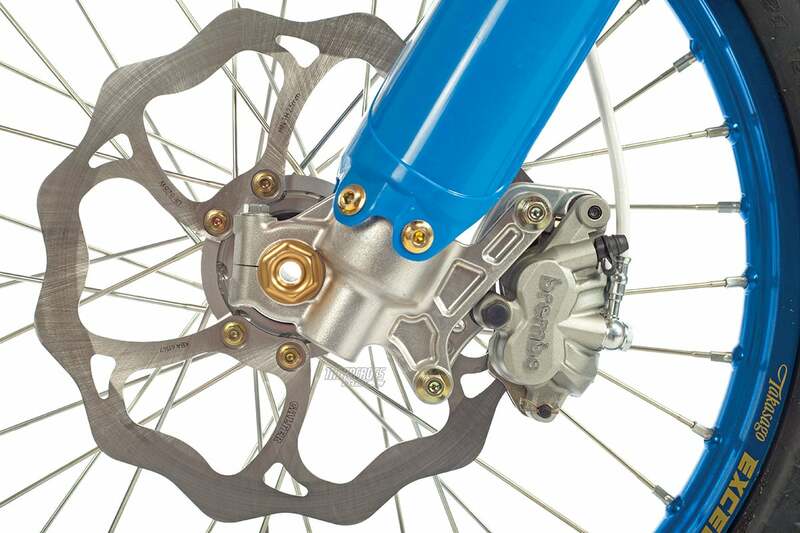 Imagine a KTM/Brembo front brake, but with a larger 270mm front rotor. It stops now. A: We ran the 2019 TM MX250-FI on the same dyno that we use on all of our test bikes—and did it on a day when we were running other bikes to make sure there were no glitches. The 2019 TM MX250-FI produced 39.67 peak horsepower at 12,500 rpm with 19.23 pound-feet of torque. From 7000 rpm to 9000 rpm, the MX250-FI produced three horses more than the 2018 Honda CRF250 (although both are down two or three horses to the rest of the 250 pack in that rpm range). From 10,000 to 11,000 rpm, the power flattened out. This rpm range is where the KX-F, SXF and FC kick into high gear and the TM 250FI takes a breather; however, after 11 grand, the TM gets a second wind and gains steam as it revs out. The dyno reveals that the TM has a high-revving top-end engine, much like the Honda CRF250, but with significantly more bottom and mid than the red bike (although the green, blue, yellow, orange and white bikes wax both of them at that rpm). While 39.67 is a solid peak number, every other 250, save for the lowly Suzuki RM-Z250, can beat it in both horsepower and torque. The numbers bring up some questions that can only be answered on the track. To get the most out of the 2019 TM MX250-FI you have to rev it to the moon. While its powerband is very similar to the 2018 Honda CRF250 in that it gives up low-to-mid in favor of top-end power, the TM has better low-to-mid than the Honda, with a broader top, but less peak. Q: HOW FAST IS THE TM MX250-FI ON THE TRACK? A: The 2019 TM MX250 is a sleeper engine. It has just enough low and mid to work the fringes of the powerband. It is smooth, with just enough power to get you where you want to go. The way this engine delivers power down low makes the bike extremely easy to ride. Although it is not as quick as its competition off the bottom, save for the sluggish CRF250, the real working part of the TM’s powerband is found high up in the rpm range (again, very much like the CRF250). When you get there, you will know it. The MX250-FI pulls hard, strong and far. It is true that some test riders referred to the 2019 TM MX250-FI as an “Italian Honda,” but they were surprised by how it ran. Every MXA test rider who raced the TM MX250-FI loved the power spread. Even though they knew the actual horsepower and torque numbers, they said that it felt much stronger than the numbers led them to expect. Be forewarned, this is a high-rpm engine that requires an all-out attack plan. But, for some reason, its middle-of-the-road low-to-mid transition, while not impressive on the dyno, helped make the most of the top-end power once in motion. There are some obvious flaws in the power delivery that mapping could iron out—if the Italians would give us the base Micro-Tec map—but even without it, the whole is much better than the parts. This is a clean and easy-to-access airbox, but it is also alarmingly loud. It is much louder than the Yamaha design. Q: HOW DOES THE SUSPENSION WORK? A: The SSS Kayaba forks and TM shock work in unison with each other. These forks work like the Kayaba units on a YZ250F. Why shouldn’t they? They are the same forks, but they never have worked alike, until now. This is some of the plushest and most well-balanced suspension on the market. 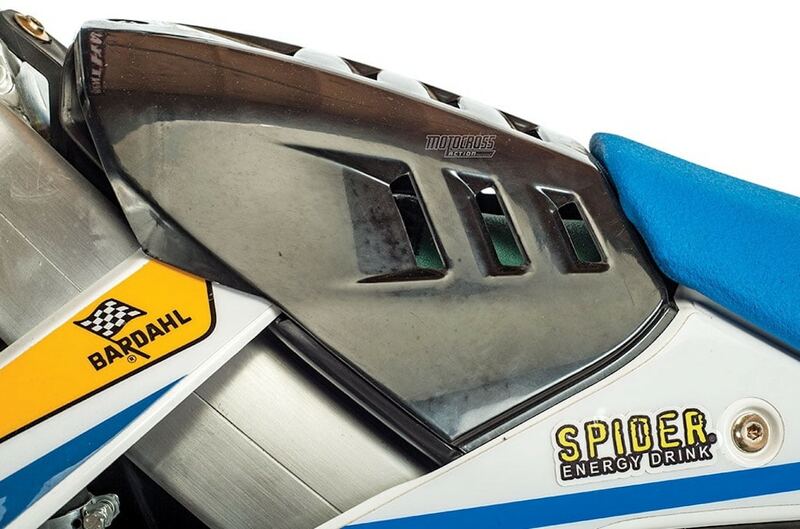 Paradoxically, the springs are on the light side for heavier riders. We ran out-of-the-box settings front and rear with our lighter riders and went stiffer on the compression for our heavier testers. Impressive. Q: HOW DOES THE TM 250-FI HANDLE? A: Exceptional. Great. A revelation. 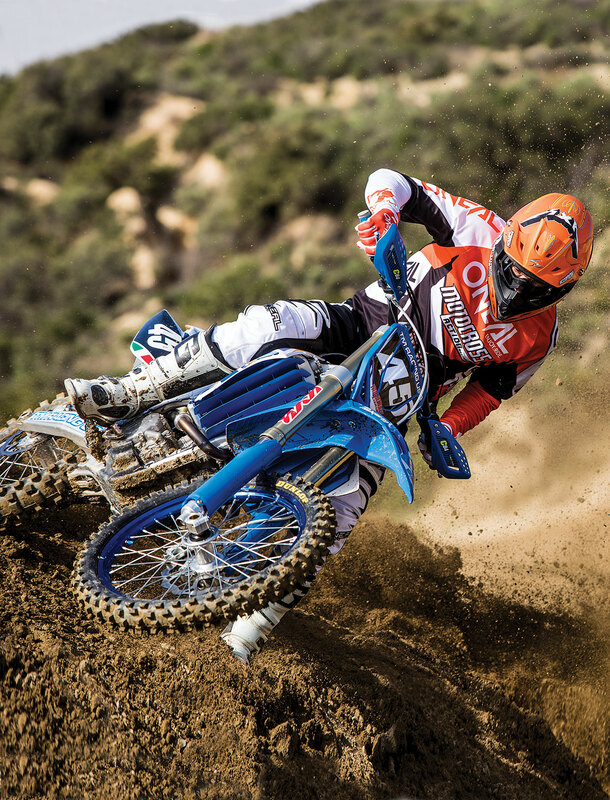 Every MXA test rider was surprised with how well the TM handled. The combination of good components, excellent front-to-rear balance and a laser-guided front end makes this bike a winner. Faster riders could feel the weight in the corners. We can only imagine how nimble this bike would be if it lost 10 pounds. Every MXA test rider loved the side-mounted F1-style gas cap—until they tried to get the cap loose. We used pliers. (1) Rear sprocket bolts. We like that we don’t have to worry about the rear sprocket coming off mid-moto like we do the KTM’s, but nine sprocket bolts are overkill. (2) Airbox. 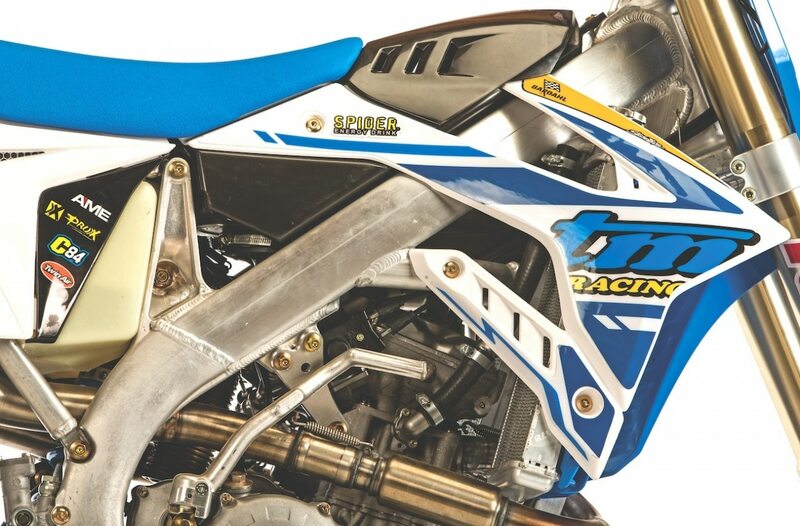 From a simplicity standpoint, the design of the front-mounted airbox is cool—although earplugs are recommended, as the TM’s airbox makes a Yamaha seem quiet. (3) Gas cap. 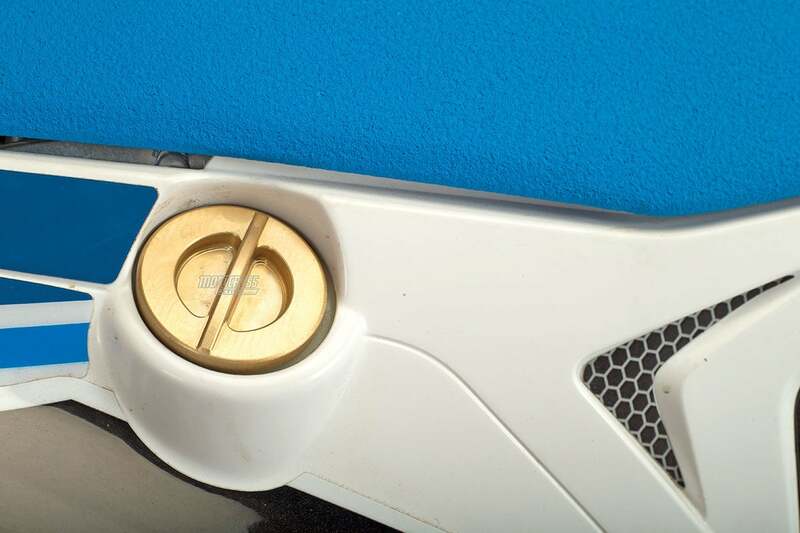 We think the F1-style side-panel-mounted gas cap is unique, but we couldn’t get the cap off without using pliers. (4) Weight. It is the heaviest bike in the class. (5) Grips. In a world of awesome aftermarket grips, testers felt the grips were too fat. (6) Push-button maps. Why does the traction control map feel like the aggressive map, and the aggressive map feel like the traction control map? It is confusing. (7) Front fender. When you land hard, the front fender hits the front tire. It makes it sound like the forks are bottoming. We shimmed it so it wouldn’t hit, but they should have done this at the factory. (8) Gearing. Standard gearing is 13/51 (3.923 ratio), which is too tall. Light riders preferred a 12/49 combo (4.083 ratio), while most chose a 12/50 setup (4.167 ratio). (9) Shifter. The stock shifter is a non-starter. It is useless. Unless you wear a size-6 boot, you won’t be able to get your foot under it. We cut two shift levers apart and welded them into a 1-inch-longer shifter. TM USA will offer a longer aftermarket shifter while trying to convince the factory to make a longer shifter OEM. We changed the stock 13/50 gear ratio for a much lower 12/50. Note the nine bolts holding the sprocket on. (1) Brakes. The Brembo brakes with 270mm Galfer rotors are amazing. They might squeak now and then, but they do the job better than the competition. (2) Wheels. The blue Takasago Excel rims and polished spool hubs look nice on the TM. (3) Suspension. 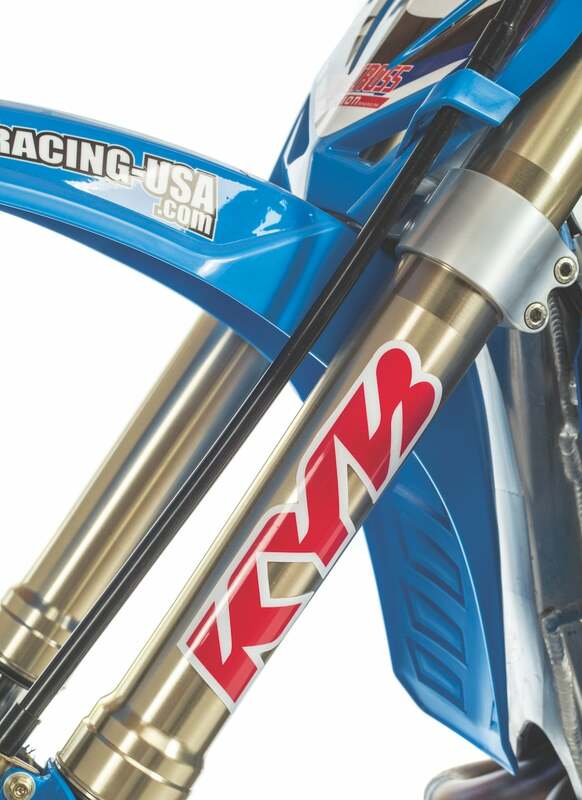 The Kayaba SSS forks and TM shock work in unison; we never thought we’d say that. (4) Hydraulic clutch. The self-adjusting hydraulic clutch is great. (5) Handling. This is a great-handling bike. It can turn on a dime and has good straight-line stability. (6) Contact patch. All our testers liked that the TM offered a lot of grip for their legs. The contact patch is ample. (7) Engine. Yes, we did have complaints about how it ran on the dyno, but those disappeared on the track. A: TM Italy has finally understood that its past bikes haven’t suited American tastes. And, if they want to grow, their best hope is to expand the American market by addressing American concerns. It wasn’t long ago that when we assigned a test rider to race a TM, he looked at us like we were giving him a blindfold and a cigarette. Now, test riders fight to get the assignment. The 2019 TM 250-FI is a very good bike. It handles with the best of them and has an engine package that works for a variety of different reasons. Yes, they are expensive, but only 1200 units a year are handcrafted in the old-school Italian factory. They are a rare commodity. This is how we set up our 2019 TM 250-FI for racing. We offer it as a guide to help you find your own sweet spot. Notes: The Kayaba SSS forks are plush. For fast or fat riders, the spring rate needs to be bumped up. Notes: Now that the rear of the bike is lower to the ground, we could get the bike balanced front and rear, which eliminated the previous stinkbug stance. At 105mm of sag, it still felt a bit high in the rear. We dropped it to 110mm where it felt comfortable.